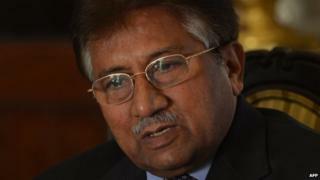 Pakistan's former military ruler Pervez Musharraf has failed to appear in court for his trial on treason charges. His lawyers told the court there was not enough security for him. His trial was postponed last week after reports a bomb was found on his route to court. The treason charges relate to his decision in 2007 to suspend the constitution and impose emergency rule. Mr Musharraf, 70, denies the charges and says all the accusations against him are politically motivated. He is the first Pakistani former military ruler to face trial for treason. If found guilty, he could be sentenced to death or life in prison. He also faces separate charges of murder and restricting the judiciary. His lawyers told Wednesday's hearing that more explosives had been found close to Mr Musharraf's residence on the outskirts of Islamabad. "He is unable to appear before the court because of security hazards," his lawyer Ahmed Raza Kasuri said. The court also heard one of Mr Musharraf's lawyers, Anwar Mansoor, was recently attacked by a group of men in Lahore. Although he managed to escape unharmed, police refused to take his complaint seriously. The defence team is arguing that Mr Musharraf cannot get a fair trial in Pakistan. Defence lawyer Anwar Mansoor said the current prime minister, Nawaz Sharif, "has a bias against" his client. Mr Musharraf seized power from Mr Sharif in a coup in 1999. He remained president until 2008, when a democratically elected government forced him to resign. He left the country soon afterwards to live in self-imposed exile in Dubai and London. On his return to Pakistan in March 2013, Mr Musharraf hoped he could lead his party into elections, but was disqualified from standing and found himself fighting an array of charges relating to his time in power. Correspondents says many Pakistanis believe Mr Sharif's government is using the trial to divert attention from the problems the country is facing, including a struggling economy and continuing sectarian and other attacks. On 24 December, Mr Musharraf's lawyers said he could not appear in the courtroom because of a heightened security threat after explosives and weapons were found by the road along his route. The court granted Mr Musharraf a one-off exemption from appearing.